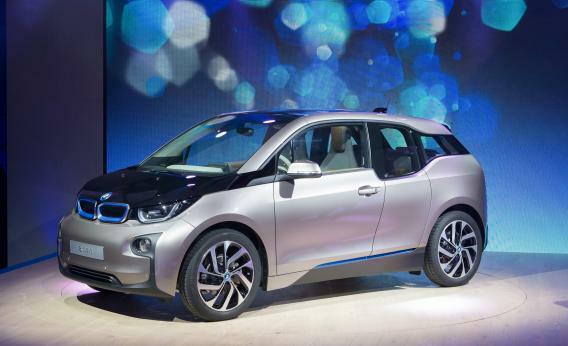 BMW i3 review: Electric car is a cheap, ugly Tesla Model S with an SUV on the side. Behold the new all-electric Pontiac Aztek—er, BMW i3. I was ready to love BMW’s new electric car, the i3. Maybe I will, once I get the chance to drive it. I’d really like to love it, if only so I can stop raving about the Tesla Model S all the time and rave about a different car for once. But at first glance: yeesh. It has the range of a Chevy Volt and the looks of a Pontiac Aztek. And those aren’t even the most disappointing things about it. The i3 is a big deal, or at least it was supposed to be, because it was designed from scratch to be an electric car, like Tesla’s Model S was—and because it’s a BMW, which implies that it’s well-built. It had been hailed, in fact, as BMW’s answer to the Model S. But it does not seem to be that. The problem is that “not bad for an electric car” is precisely the epithet that had always dogged electric cars prior to the Model S. What made the Tesla different was that it refused to apologize for being electric. It turned the tables and forced competitors, BMW included, to apologize for the relative shortcomings of their gas-powered offerings. Why don’t they accelerate as smoothly? Why are they so noisy? Why do they have such a high center of gravity? Why can’t you put anything in the frunk? BMW, in contrast, is apologizing for the i3’s shortcomings in the most obsequious way possible: by offering buyers access to a gas-guzzling, full-size SUV as a backup. You know, for those times when you need a real vehicle, because your electric buggy just won’t cut it. Oh, and there’s also an optional 34-horsepower motorcycle engine that you can have installed alongside the electric motor, because clearly electric motors on their own are not to be trusted. The bike motor’s 2.4-gallon tank effectively doubles the car’s range, which sounds helpful if also a little sad. Add that internal-combustion engine, though, and you’re subtracting from one of the car’s genuine virtues. Thanks to lightweight materials and thoughtful design, it weighs just 2,700 pounds without the optional engine. The Model S, in contrast, checks in at a hulking 4,650 pounds, which limits its agility. The other way in which the i3 beats the Model S is on price. The i3 will start at $41,350 without the engine or the SUV, making it far more realistic for most drivers than the $70,000 Model S, if still not exactly a steal. Provided that it drives like a BMW, then, the i3 has a good chance of conquering the currently hot “electric cars for people who are quite well-off but not rich enough to afford a Tesla” market. That alone would make it a success, considering how well the Volt and the Leaf are selling these days. But, perhaps unfairly, I had hoped for more. I had hoped that BMW could do at a lower price point what the Tesla’s Model S did to the $75,000-luxury-car class—that is, beat its competitors on performance while matching them on price. Instead, it set for itself a lower bar: the “not bad for an electric car” bar. Whether it clears that bar, time will tell. All I can say for now is, let’s hope it drives better than it looks.